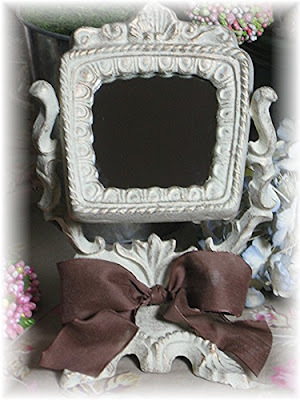 I love this pretty vanity mirror. It's just been placed under the tent! My husband continues to work on finishing our basement (he is currently still completing the playroom area). Next will be my creative studio space also in the basement. I know we are still months away from completing my space but I couldn't help picking up these great finds at TJMaxx the other day. 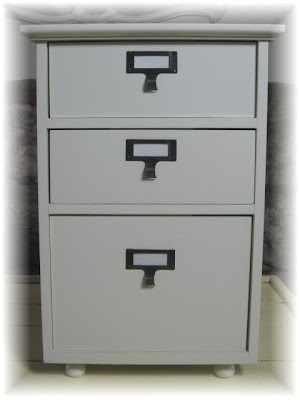 The trunk style boxes were only $5.99 and $7.99 and the mini file drawers were $19.99. I am actually going to start filling them up. My plan for tomorrow is to relocate all of my supplies to my dining room as a temporary work space until the basement is done. 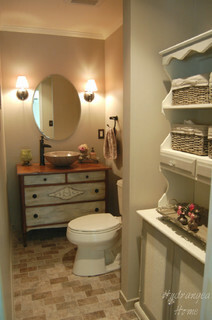 I have had so many new ideas swirling around in my mind (usually while in the shower). And just can't wait to get to work on them. My goal for this week! 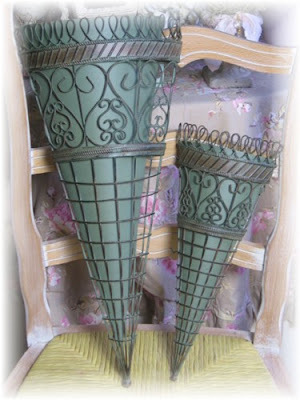 I have just added some of these French Wire floral cones to the Tent Sale! 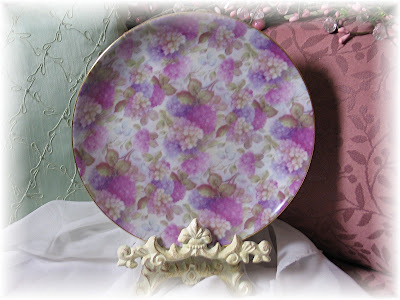 These pretty Hydrangea plates have just been moved under the Tent at a great price too! Check back every Tuesday for more Tent Sale treasures! So today I am totally procrastinating. The only thing I don't like about my business is the paperwork. I hate it actually. I basically have put off all of 2007 record keeping and now I am facing a huge pile to get through. It's my goal for today to tackle this mess and I thought it would be more fun to post about my daughter's party first. Yesterday we celebrated her 4th birthday with a few friends and a Strawberry Shortcake theme. She loves anything Strawberry Shortcake and I do too. It reminds me of when I was little. I am so happy they have brought this line of toys into stores again. So I also tackled one of those cake molds with all of the fun icing colors. I have to say they look a lot harder than they are to decorate. Although it was time consuming, it was so much fun to create this cake for my daughter. She really loved it! But I have to say the best part of the whole day was when my little one came to my husband and I and said "thank you for my birthday", and no one told her to say it! Cake mold and food coloring from Michael's craft store. I ordered the paper goods from Birthday Express. They have great themed party packs with everything you need! I just moved these great hooks to the tent! 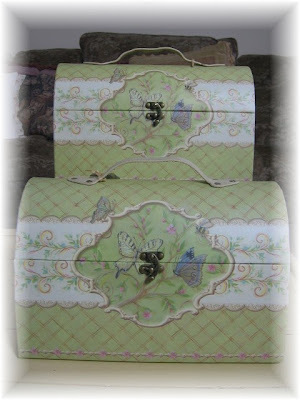 Look for more great sales in the next few weeks as I clear out inventory to start fresh! Hope everyone's New Year's celebrations were great! 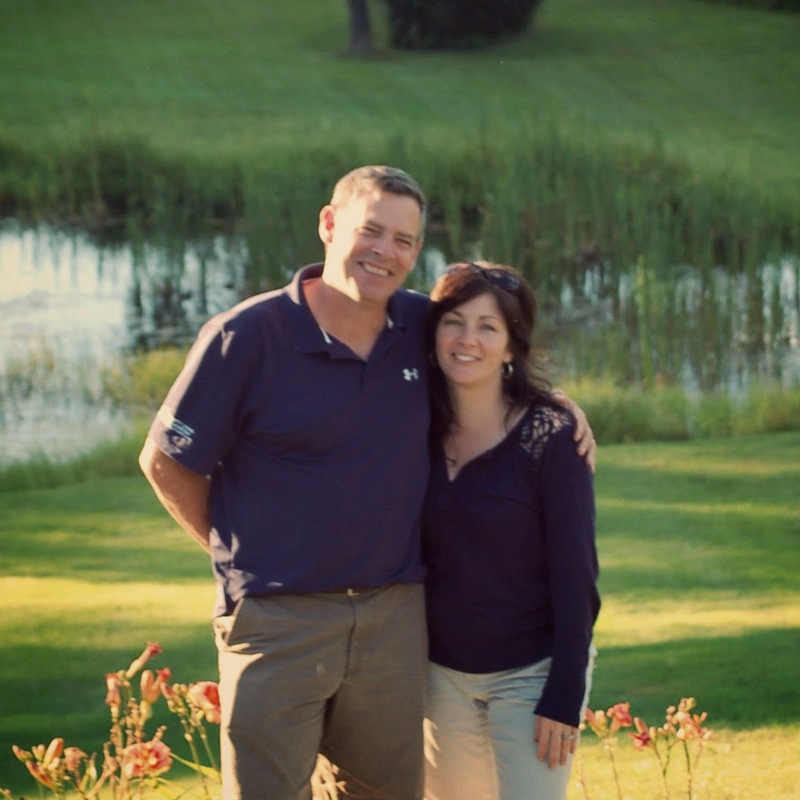 With a new year, I am making some changes to my website. It will have a new look by the end of the month. As I work on these changes, my Friday Features will be on hold until February 1st. 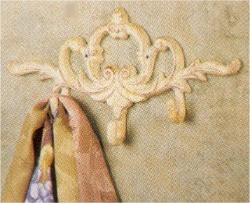 I will still continue to post on my blog and Tent Sale Tuesday will resume on Tuesday 1/8. Don't miss out on some great deals while I make room for new inventory. My new site will have some more Handmade and One of a Kind items, getting me back to what I love to do most, CREATE! I would also like to share with you some great products I received from Mom for Christmas. Stonewall Kitchen makes so many delicious, jellies, sauces, etc. They make great gift ideas too. I served some popcorn chicken with the Teryiaki dipping sauce on New Year's, sooo good! And we have had the jellies poured over a bar of cream cheese and served with crackers for a very simple appetizer. There are more recipes on their website too.